If you follow us on Facebook or Instagram you will already know that we made our way out to Las Vegas for The SEMA Show 2017 (Well half the team made it at least - Gordon). If you have never experience SEMA before you probably can't grasp just the overall size of the show, this isnt like your average car show, you can spend all 4 days of the show walking around and STILL miss out on some of the cars. There is just simply that much stuff to see! First up I (Gordon) want to share my favourite car from the show. It's a Lincoln Continental with a modern supercharged V8 under the bonnet. Looking this gangsta and having the power to back it up must be a real treat for the owner! One thing I really enjoy about SEMA is just how many legitimate racecars are on show. For instance there was an abundance of Formula Drift cars spread out among the booths. Some of the little detail on these cars get over looked but one thing that caught my eye was the fuel level gauge right above the filler neck on Essa's E46. These little details may not mean much to most but it made me smile. If you've spent any amount of time on the internet you have heard of Hoonigan, now if you watch any of their brilliant YouTube content you will recognise Hert and his car, the TwerkStallion, this was one of the cars I was looking forward to seeing before I even landed in Vegas! 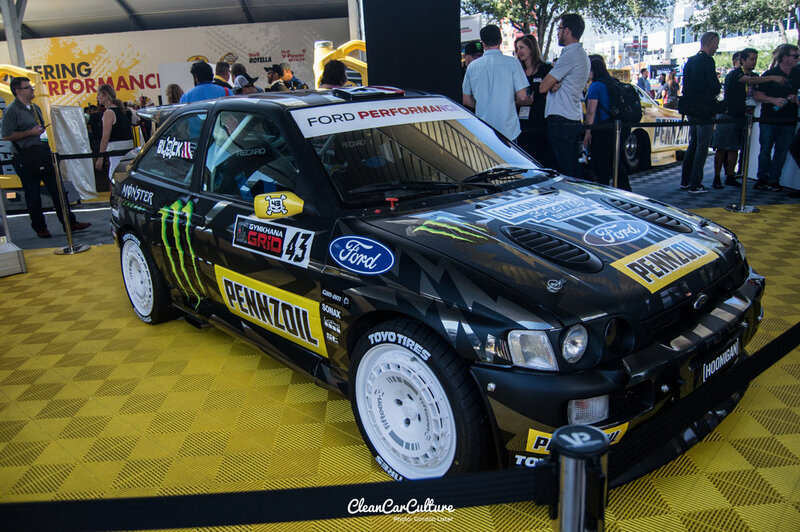 To round out Part 1 of our coverage how about some photos of Mr Internet Sensation himself Ken Block's rides that were show in the Ford and Pennzoil booths.